The application for inclusion in The Bobolink Project is now closed. 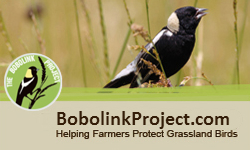 Subscribe to our enews to keep up to date on the latest from The Bobolink Project. Use the form at the bottom right of this page to sign up.